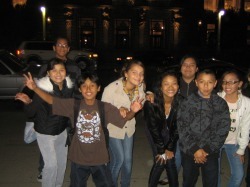 A few weeks ago, eight students from the Middle School Leadership team attended the David Brower Youth Awards, at the Herbst Theatre in San Francisco. 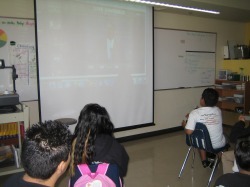 Students met youth environmental activists from all over the country. 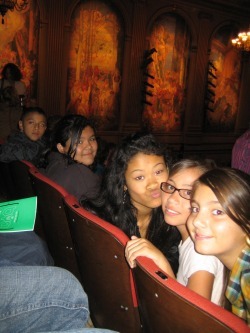 Tyrone, Ana, Sidhartha, Francis, Arianna, Lilliana, Juan, and Alaina pose in front of the Herbst theatre. 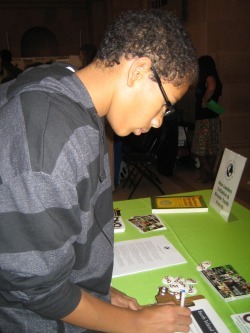 Tyrone signs up for more information about future Earth Institute events. Between performances by Youth Speaks. I learned that people eat too much junk food and that this is bad for the earth. I liked how people gave a speech and told us how they feel and then explained how the environment can help us a lot. I can't wait until we start to compost and help the earth and community. I enjoyed the poems that were spoken word about the environment and their lives. People said them really fast and that was cool. First, Flavio and Peter explained how archaeologists do thier jobs. Next, we used brushes to unearth artifacts. Then, we measured the artifact to indicate where it belonged on our map of hte site. 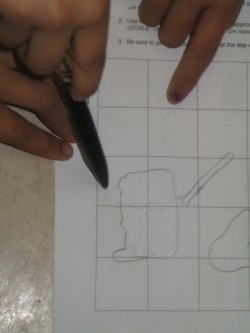 After that, we drew the artifacts on our map, and wrote down details about the artifacts we found. Finally, we categorized the artifacts, and placed them in bags. We discussed the artifacts we found and made inferences about where they came from and who used them. "I think that it's important to have a lot of imagination to be an archaeologist, because when you find something you need to think about how it got there, why it is there, and what that place was like before you." "What was hard about the excavation was that when you see an artifact you couldn't just pull it out with your hands. You have to leave it where it is to measure and map it." 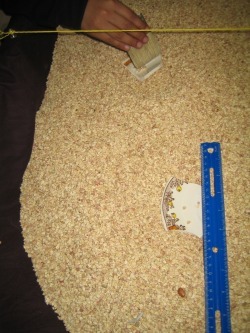 "My group found a lot of broken plates, and a piece of a bowl. Also we found a bean, and other seeds. I think our site was a kitchen because these are artifacts you would find in a kitchen." "I learned that you set up a dig facing North, but the coolest thing I learned was when we experienced what it's like to be an archaeologist. I want to learn more about history and science after this investigation." "I learned that archaeologists use brushes to look for things. I think that's really clever because that way if it is broken or poisonous they can clean it with the brush with out damaging anything. 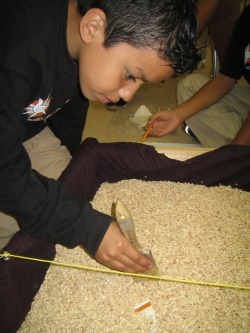 My favorite part of the presentation was when we used the brushes and switched roles to draw and describe the things we found because I felt like an archaeologist like Flavio and Peter." "I found broken pieces of pottery and an object that looked like a mushroom with a seed on it. It felt like a softened rock." Today I heard your speech on education and I really got inspired! Now I’m in the 6th grade and I think it’s time I start getting more serious about my schoolwork. In 6th grade I have been improving my vocabulary. For example, I think you are an eloquent speaker. That was one new word I learned from my vocabulary. I think you are a great role model and I really like how you talk and communicate with people, also the way you reach out to us kids. Wow! I don’t think there has ever been a president that has ever dedicated their time talking to students. I thank you for that! I believe education is important because when I grow up I want to be a CSI. That means Crime Scene Investigator. But for me to do that, that means that I have to study real hard because when I want to check the body or get the paw prints I have to use science. And if I want to get into a person’s bank account I need to use math for that. Also, not just that but I really want to be successful. But like you said being successful takes a lot of hard work, so I have to work extra hard. In your speech you mentioned the importance of being responsible and one good example I have is my cousin Laura. She is my role model right now. She goes to Cal, and she is studying biology. She is going to graduate this May, with her bachelor’s degree. Her parents don’t help her do well in school. They don’t encourage her, in fact they do the opposite. They say, “Why do you go to school so much!” It hurts me when they say that. She struggles a lot with her schoolwork. She lives all the way in Vacaville and goes all the way to Berkeley every day. And she doesn’t have that much money. They kicked her out of the dorm rooms because she couldn’t afford it, and her parents don’t give her money either. She has to work to extra jobs to afford gas. But what I love about her is that she does whatever she has to do to be successful. She really wants a good education, so she goes for it no matter how hard it is. She really wants it! I need to show responsibility too. One goal I have is to turn in my homework everyday no matter how hard it is! The steps for that are write down my homework and to have it with me. Another goal is I want it to be a bigger person. I want to help the kids that grew up with out a mom or a dad. I’m going to try to go to their shelter and read them a story. Also, I hope I can think of something else and try to do that as well. Today during your speech something that really caught my attention during your speech was the part when you said, “People succeeded because they understood that you can’t let your failures define you, you have to let your failures teach you.” That part of your speech really motivated me. Also right now we are having a lot of problems with the economy. I hope you can try to fix that Mr. Obama because right now none of my family has a lot of money. I think that we should do something about it quick before more people loose more houses and jobs. It hurts me that when I walk by the streets I see a lot of people selling flowers with their kids and their kids have no shoes. That’s what breaks my heart. Poor kids with their little tiny feet all crushed and cut. I really want to help them like maybe buy them some shoes or clothes. You should make a donation for those kinds of families. Well Mr. Obama, keep up the good work and have a nice afternoon. I believe education is important because with out it you will spend the rest of your life poor, with no life, and maybe even wrecking up your body with drugs and other bad things. With education you will pass in life, get a job, have a house, and have a nice family. In order to get a good education you have to show personal responsibility. One example of a person who has shown personal responsibility is my brother Umar. He has ran two marathons and is planning to do two more. He did one in his freshmen year and one in his sophomore year. Umar is focused on his homework and gets it done even though he has a ton of it every single day. One goal I have to show personal responsibility for is to read all the Harry Potter books made. I started to read the first one not too long ago and to read all of them I need to study hard and read more on my free time and at school. It may be tough, kind of like marathons, but if I put my head to it I can do anything. This morning you said, “J.K. Rowling’s –who wrote Harry Potter- her first Harry Potter book was rejected 12 times before it was finally published.” Those words influenced me greatly in my goal of reading the Harry Potter books, and in real life. Now in anything when I fail I’m going to try 12 more times before I completely give in to what I’m trying to do. Hi. I’m a student at ASCEND school and I do think education is important. I believe education is important because when we grow up we want to have a good job so you can get money. Education will help me achieve my goals because I want to be a singer and actress, but what an agent told me was that I need to have good grades and work hard because if I don’t I can’t be any of these. Look, a director won’t ever hire a girl with such a bad education he needs a smart girl with a good education. When you mentioned responsibility someone just popped out of my head. It was my sister because she has a baby girl and she’s only 17 years old. Instead of dropping out of school she keeps going to school and it’s difficult because of all these things she’s doing. Also, she’s working really hard so sometimes I have to get home and help her with my baby niece. Sometimes I just want to to tell her how responsible I think she is, but I’m always too afraid. I will try my best to know all my multiplications because I only know some of them and I’m getting tired of everyone knowing all of them but I’m the only one that doesn’t. 2. Tell my mom when she gets off work to help me. 3. Get flash cards and start making them. Another goal I have is I want to study after every test because I got a D in my first test and that motivates me to study to get all B’s and A’s. There was one thing that you said that actually touched me a and that was, “The future of America depends on you!” I don’t know but something about it makes me feel…”special.” I know what you are thinking, “Oh this little kid really think she’s special!” But somehow I do because what ever you do involves your country in it. Also if you have a good education America would be proud and you should too because you’re helping America just by that one little thing. I believe that the challenges of middle school would get harder and we can’t give up because if we do you might just end up probably in the streets. Also not just that but you might hang out with the wrong people. One big problem that I’m scared of is going to college. I don’t know but I’m scared because I feel like if I’m not going to get accepted no where. Also I’m scared about thinking about dropping out. I don’t even want to think about dropping out because I want to graduate. But I won’t because if I have fantastic grades I won’t need to be scared of anything. One thing I can do is to not give up! That will help the world because my kids will see I tried hard and when they have kids they’ll see she tried hard, and it keeps going on after generation through generation. P.S. You’re the best president! 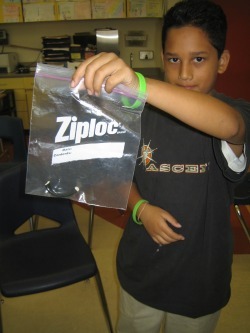 I am a student at ASCEND school in Oakland, California. My name is Jesse XXXXXX and I want you to read this letter and give me a response to my response to your address to American students. I believe education is very important to everyone because we can come up with ideas for more energy efficiency. I also think we can break the Guinness book of world records of the most fuel efficient car that goes 105 miles per gallon, and solar power cars that recharge the battery and makes the wheels move. I can show responsibility by taking charge of my own learning and going to get my Phd. The academic goal I want to achieve is to pass everything there is about learning and make energy efficient technology. I also want to make a good way to make less waste in our environment. This is true and I also want this to be real so we can stop global warming. In the future as we all grow, the struggles I believe the world will face is that the ocean will over flow because ice is melting in all the places that are supposed to be cold. I also believe that more animals will be gone from the face of the earth if we don’t change our ways. I want this adventurous and amazing planet to stay forever. 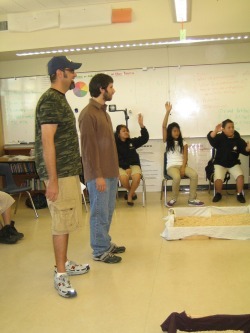 We're a 6th grade humanities class at ASCEND, a K-8 small school in Oakland, CA. This blog is a joint effort between all students. We hope it provides the readers and writers of room 110 with a genuine audience for their writing, and a place to read and interact with new and exciting ideas.